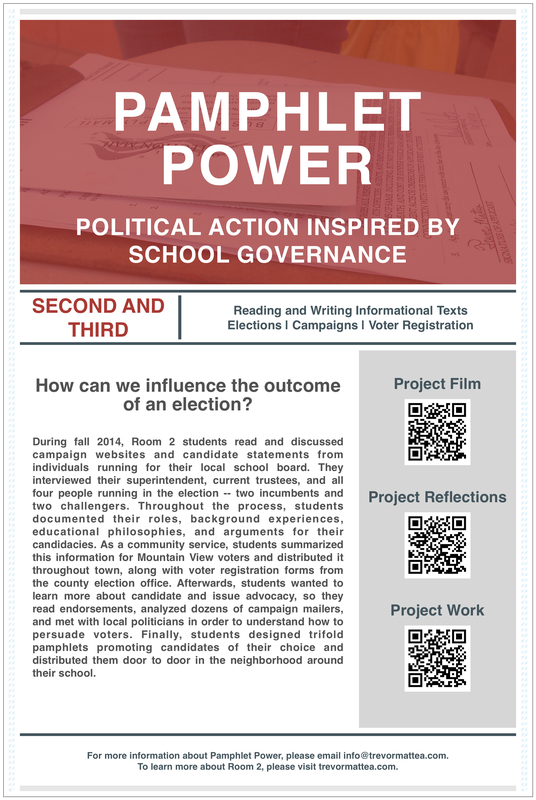 During fall 2014, Room 2 students read and discussed campaign websites and candidate statements from individuals running for their local school board. They interviewed their superintendent, current trustees, and all four people running in the election -- two incumbents and two challengers. Throughout the process, students documented their roles, background experiences, educational philosophies, and arguments for their candidacies. As a community service, students summarized this information for Mountain View voters and distributed it throughout town, along with voter registration forms from the county election office. Afterwards, students wanted to learn more about candidate and issue advocacy, so they read endorsements, analyzed dozens of campaign mailers, and met with local politicians in order to understand how to persuade voters. Finally, students designed trifold pamphlets promoting candidates of their choice and distributed them door to door in the neighborhood around their school. This project was featured in The Mountain View Voice.